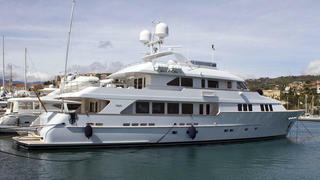 The 38.62 metre motor yacht Areti II, listed for sale by Burgess, has been sold with Yachtzoo introducing the buyer. Built in aluminium by US yard Burger Boat to ABS class Areti II was delivered in 2007 along with her identical sistership Areti I, both commissioned by the same owner. With worldwide business interests, he based Areti I off the East Coast of the USA while Areti II was used to cruise the Mediterranean and Adriatic. Panelled in Makore wood with soft cream fabrics, Areti II accommodates 10 guests in five cabins consisting of a main deck master suite, VIP suite, double and two twins, all with entertainment centres, television screens and en suite bathroom facilities. There is also accommodation for seven crew. The saloon continues the theme of Makore panelling and has comfortable seating on an L-shaped settee and two armchairs facing an entertainment centre including a large television and an updated audio and video system. Forward is a full beam galley with all the latest appliances plus a marble topped dinette seating eight guests for sociable breakfasts and casual snacks. Special features include a full sauna on the lower deck while the sun deck offers a range of sun pads and a Jacuzzi spa tub. Twin 1,300hp Caterpillar diesel engines give her a range of 3,300 nautical miles and she is fitted with Quantum zero speed stabilisers. Areti II is the second Burger superyacht that Burgess has sold in just eight days, following the sale of Sycara IV last week. Areti II was asking $11,300,000.